During the Dec. 1 meeting of the Siesta Key Association (SKA), it was only fitting that an issue near and dear to the heart of special guest Stephen Leatherman — aka Dr. Beach —also was on the agenda that evening. 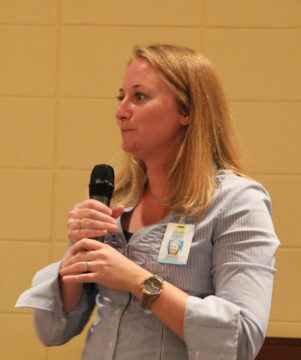 Kelli Pond, who works with the Tobacco Free Partnership of Sarasota County, addressed the audience briefly regarding that group’s efforts to reduce tobacco-related diseases and deaths in the community. 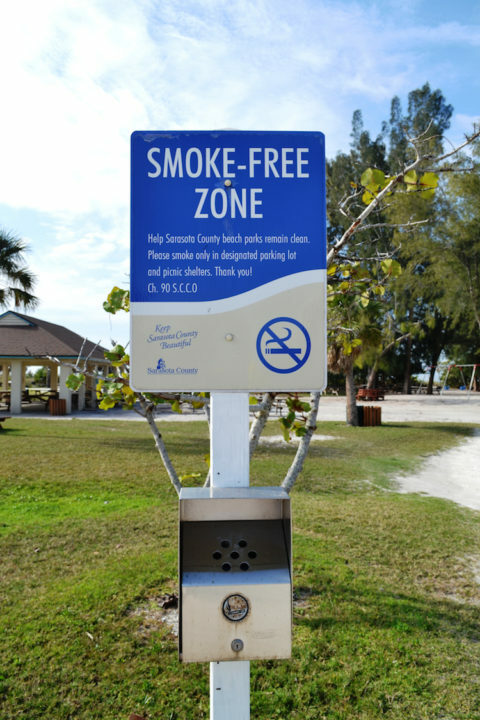 The organization’s recent initiatives, she explained, have been focused on cutting down on the amount of tobacco litter, especially on Siesta Key Beach. The target is a 50% decrease in that type of trash, she noted. The partnership has been working with Sarasota County’s Parks, Recreation and Natural Resources Department and the county’s Keep Sarasota County Beautiful program, she said, as well as other groups in the county. Pond invited interested members of the audience to attend the partnership’s next meeting, which will be held at 3:30 p.m. on Thursday, Dec. 15, at the William L. Little Health and Human Services Center, located at 2200 Ringling Boulevard in Sarasota. The county Health Department’s website says the session will end at 5 p.m.
“It’s going to be a very in-depth meeting,” she added. 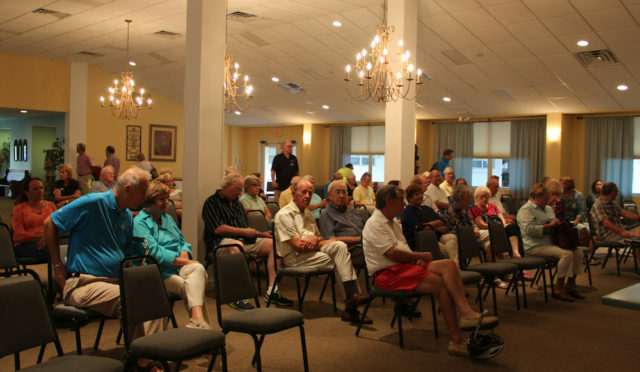 “What about ‘home rule’?” Siesta resident Mike Cosentino asked Pond during the SKA meeting, referring to the fact that Sarasota County has its own charter. She replied that state law prevails over local ordinances. When a woman in the audience asked about citing people for littering the beach with cigarette butts, Pond told her, “That might be a strategy that we can consider,” adding that the partnership members are in the “very early” stages of work on potential action. It is a priority for both the County Commission and the Florida Association of Counties, he said, to make it possible for home rule to prevail regarding efforts to prevent tobacco use on beaches. Lewis is scheduled to provide an update to the board during its set of meetings next week. After Leatherman concluded his formal remarks related to the Lido Renourishment Project (see the related story in this issue), SKA Second Vice President Catherine Luckner asked him on Dec. 1 to talk about his criteria for his Top 10 beaches list. Leatherman ranked Siesta No. 2 on his 2016 list. It was his No. 1 beach in 2011, as noted in signs still standing along roadways leading to the Key. For more information about the Tobacco Prevention Program of the Florida Department of Health in Sarasota County, call 861-2969. During the Dec. 1 SKA meeting, Leatherman regaled the audience with tales of his travels around the world to handle issues related to beaches and sand. For one example, Leatherman talked of a trip he took to the British Virgin Islands (BVIs) earlier this year at the request of the owner of the Briars Creek Resort. It is a “quite expensive” place to stay, Leatherman noted, adding that it has three different beaches. 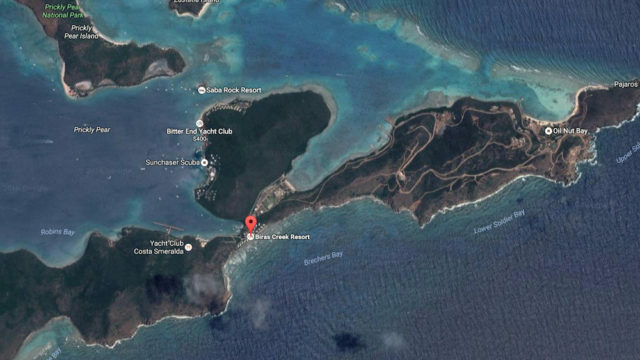 To underscore the exclusivity of this particular part of the BVIs, Leatherman pointed out that while he was there, he saw the yacht owned by Sir Richard Branson, who owns the nearby Necker Island. A neighbor was building a heliport nearby in the water, Leatherman said, so the resort owner suspected that project might have something to do with the hole. Upon his investigation of the site, Leatherman continued, he could find nothing about the heliport that would explain the significant loss of sand on the resort’s beach. When the owner then asked whether extraordinarily big waves could have carved out the hole, Leatherman discounted that theory as well. The resort had been closed for a while, Leatherman pointed out, so the theft probably occurred when the owner was away from the property. Leatherman also noted that he had just returned to the United States after attending a conference in Morocco that focused on coastal management for the Arab States; the government of Dubai paid his way. Because of the vast amount of construction taking place in Dubai, Leatherman explained, sand is in great demand for making concrete. “The country of Dubai has put out a general notice that they are looking to buy sand,” he added, then asked the SKA audience members to think about that for a moment. Murmurs of “Oh, my,” circulated in the audience. Therefore, Leatherman said, Dubai has no choice but to try to purchase sand. Luckner said she called the USACE’s Jacksonville District Office to complain that the part about the pass was incorrect. Anyone who had looked at historical maps of the area, she added, would have known that the pass has been there for quite a long time. The audience member — who left before the News Leader could ask his name — said Lido “was mostly marsh and mangroves” until Harry Higel built it up after he created Bird Key. Laughter erupted at that point. According to the Sarasota Times, Higel was found lying unconscious near Siesta Village early on the morning of Jan. 6, 1921. The paper reported that he was “struck down in an insane frenzy or a deliberately planned and cruel murder, left bleeding and dying alone …” He died as the two men who found him tried to transport him to the Tampa Hospital, the paper said. Referring to the “Turkey Trot” hosted by Siesta Village restaurants on Nov. 23, McGregor added, “We did have the pub crawl with minimal issues. Actually, it was a really good pub crawl.” He did not recall any arrests having taken place. The next pub crawl will be the “Santa Stumble” on Dec. 26, McGregor said. 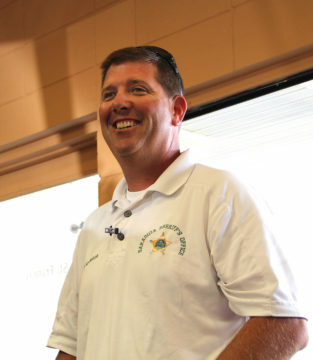 Deputies did deal with some illegal parking situations, however, he pointed out. For example, citations were written to drivers who left vehicles on sidewalks.